This past weekend I participated in the 3rd Annual South Dakota Canoe and Kayak Association Niobrara River Trip; this was my second year to participate. The trip is organized by Cory Diedrich. As last week came to an end, it looked like we would have rain for the trip to Valentine, NE/Smith Falls State Park and Friday night, but Saturday/Sunday was looking like low chances of rain with high temperatures in the 50s/60s; low temperatures in the 40s. The wind was forecast was for teens on Saturday and single digits on Sunday. Exciting news! On my way down, the salesman from Wegner Auto called to let me know that my new pickup showed up on the lot. It was all I could do not to turn around! When I turned down the "gravel" road to Smith Falls, I was relieved that the powers that be had left it in similar condition as it was for last year's trip. Actually, a couple of the hills did seem to have been regraded/compacted. But, it was sloppy. It was still raining when I arrived at the campsite, but Cory had a plan! He had brought along a small dining fly that he had setup his tent underneath; we moved the fly over and I did the same. We BSed a bit as we waited for the rest of the crew to arrive. The flotilla would consist of just kayaks, paddled by Cory Diedrich, Sam Diedrich, Roger Debates, Tom Coughlin, Steve Joseph, Kati Albers, Jen Geyer, Willard Story, Matt Story, and me. The rain had stopped and started a couple of times while people were arriving. By the time everyone's tents were up, the rain had ceased for the night. On Saturday morning, we got up and loaded Cory and Sam's boats onto Roger's trailer. We headed into Valentine for breakfast at a local cafe; Cory and Sam rode with me. After breakfast, we headed to Cornell Bridge to begin the cruise. Luckily, we had no surprises launching this year. Some canoeists launching for the fun day at Smith Falls State Park. We arrived back at Smith Falls State Park by early/mid afternoon. We covered 11.4 miles by my gps, but I paddled upstream earlier to check on Steve when he had trouble around a strainer; He spilled out of the boat, but we were in a shallow side channel. Matt was at the scene to assist him and everything turned out fine. As we took it easy for the afternoon/evening, we met the newest member of the National Park Service working the Niobrara National Wild and Scenic River. I don't recall his name, but he is an avid whitewater canoeist. We also found out that he enjoyed surfing/playing in a wave at the rapid at Rock Ford. Cory got his card and I think we plan on getting him involved with SDCKA and/or Black Hills Paddlers. For supper, Cory whipped up some delicious cajun chicken tortellini. It was excellent. We got up on Sunday, tore down camp, and had a little breakfast. I made a pot of coffee (both days actually) and we used up the eggs I brought. I wanted to get them all used because the carton was soaked from melting ice in my cooler and I wasn't sure if it would hold up on the way home. We combined the eggs with some bagels that Cory had brought. After shuttling the vehicles down to Rocky Ford with Cory's pickup, we began the second day's cruise. Fyi, it has been sprinkling off and on since breakfast. The Sunday half of the cruise is a little choppier/rougher and we were joking about the recent American Express commercial as we paddled through the ripples. The run was easy; Roger, Matt, Tom, and I ran dropped it (everyone else went around). Roger went just to the right of center, Matt took it at the center, and I was just to the left of center. I did not see where Tom dropped it, but we all had clean runs. Here is what the NPS website has to say about Fritz's Island rapid: Fritz's Island Rapid or Fritz's Ledge is usually runable above 900 cfs, with a straight, 2' drop over ledge and a powerful current. And from the Nebraska Game and Parks: One mile farther is Fritz Island. Go left around the island. Going to the right will take you over a rock ledge where it is easy to capsize. Fyi, the flow was around 1100 cfs for us. Immediately after the drop, we took a break at Stair Step Falls. We had some fun with group pictures and joking about the recent American Express commercial. 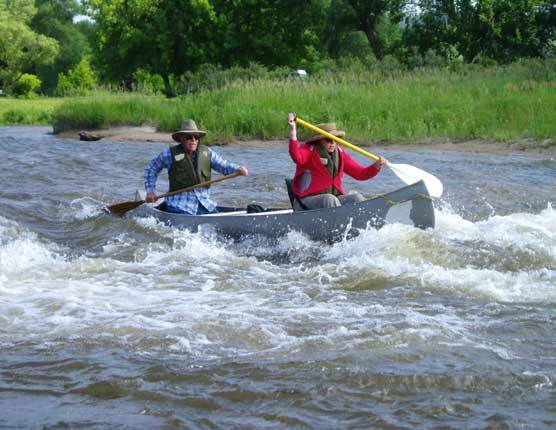 Tom Coughlin "going through the rapids". Roger Debates "going through the rapids". We continued on. The next obstacle was Fritz's Chute (aka Fritz's Narrows). We did have a little trouble here. Somehow Kati's boat got turned in the rapid and took a wave broadside and was flipped. Cory and Roger were on the scene quickly. Around the bend following the rapid was a shallow spot where Kati was able to get herself and her boat out of the river. Roger also got out and helped pump the water out of the boat. Everything was good. Kati was still in good spirits afterwards. Maybe a little embarrassed at worst? Cory led another great trip done a fun river this year. Here's hoping we get some more folks to join us next year! Nice write-up, Pat! Glad you guys had an enjoyable outing! Congrats on the new truck!